Just because stretch marks are normal doesn’t mean you have to live with them. Skin imperfections on the face and body can detract from a person’s self-image, and can make clients look older than they want to appear. Stretch marks are a common part of life for many men and women. When the skin has been stretched too far or too fast, such as during puberty, pregnancy or weight fluctuation, these unsightly lines appear. For women, stretch marks commonly develop during pregnancy because the skin is being stretched too far too fast. In fact, stretch marks occur in over 90% of women during their pregnancy. At Noydeen Beauty, we utilized fractional non-ablative laser technology for skin renewal to address stretch marks. Fractional laser technology uses pulses of laser light to target and break down stretch marks, triggering new tissue production underneath the skin. This new collagen will help improve both the texture and color of the stretch mark. It’s also FDA cleared for the treatment of stretch marks and makes it the premier non-surgical procedure that provides remarkable results in only a few short treatment sessions. This procedure is completed in less than 30 minutes and you will see outstanding results in just a few simple treatments. With a series of treatments, our clients at Noydeen Beauty can expect to see a decrease in the appearance of your stretch marks and a smoother texture of the skin. Fractional non-ablative laser technology is designed to treat stretch marks on any area of the body.. Stretch marks that are less than 6mm or less are the best candidates for treatment caused by pregnancy, weight gain and body changes due to puberty. 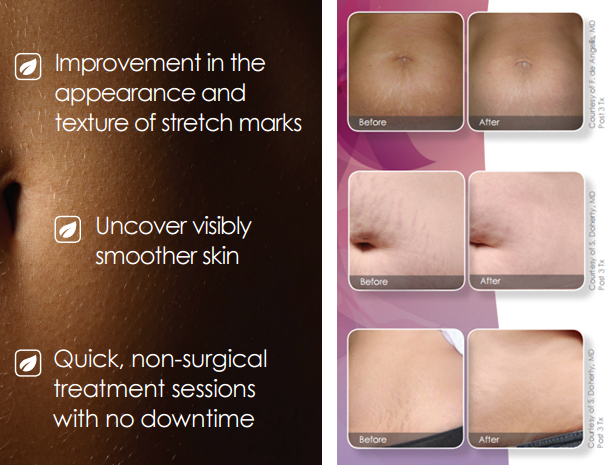 Depending on the condition being treated 3 -6 treatment sessions are recommended for stretch mark reduction.